This article is about the city. For other uses, see Santo Domingo (disambiguation). Note: "D.N." (Distrito Nacional) strictly refers to the city proper, i.e. excluding the surrounding Santo Domingo Province. Santo Domingo in the Dominican Republic. Prior to the arrival of Christopher Columbus in 1492, the native Taíno people populated the island which they called Quisqueya (mother of all lands) and Ayiti (land of high mountains), and which Columbus later named Hispaniola, including the territory of today's Republic of Haiti. At the time, the island's territory consisted of five chiefdoms: Marién, Maguá, Maguana, Jaragua, and Higüey. These were ruled respectively by caciques (chiefs) Guacanagarix, Guarionex, Caonabo, Bohechío, and Cayacoa. Dating from 1493, when the Spanish settled on the island, and officially from 5 August 1498, Santo Domingo became the oldest European city in the Americas. Bartholomew Columbus founded the settlement and named it La Nueva Isabela, after an earlier settlement in the north named after the Queen of Spain Isabella I. In 1495 it was renamed "Santo Domingo", in honor of Saint Dominic. Santo Domingo came to be known as the "Gateway to the Caribbean" and the chief town in Hispaniola from then on. Expeditions which led to Ponce de León's colonization of Puerto Rico, Diego Velázquez de Cuéllar's colonization of Cuba, Hernando Cortes' conquest of Mexico, and Vasco Núñez de Balboa's sighting of the Pacific Ocean were all launched from Santo Domingo. In June 1502, Santo Domingo was destroyed by a major hurricane, and the new Governor Nicolás de Ovando had it rebuilt on a different site on the other side of the Ozama River. The original layout of the city and a large portion of its defensive wall can still be appreciated today throughout the Colonial Zone, declared a World Heritage Site by UNESCO. In 1586, Francis Drake of England captured the city and held it for ransom. Drake's invasion signaled the decline of Spanish dominion over Hispaniola, which was accentuated in the early 17th century by policies that resulted in the depopulation of most of the island outside of the capital. An expedition sent by Oliver Cromwell in 1655 attacked the city of Santo Domingo, but the expedition failed with the loss of 3,000 men. The English troops withdrew and took the less guarded colony of Jamaica, instead. 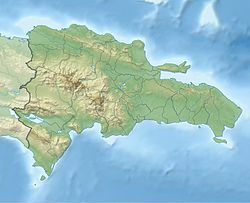 In 1697, the Treaty of Ryswick included the acknowledgement by Spain of France's dominion over the Western third of the island, now Haiti. From 1795 to 1822 the city changed hands several times along with the colony it headed. The city was ceded to France in 1795 after years of struggles, it was briefly captured by Haitian rebels in 1801, recovered by France in 1802, and was once again reclaimed by Spain in 1809. In 1821 Santo Domingo became the capital of an independent nation after the Criollo bourgeois within the country, led by José Núñez de Cáceres, overthrew the Spanish crown. The nation was unified with Haiti just two months later. The city and the colony lost much of their Spanish-born peninsular population as a result of these events which caused a great deal of instability and unrest. 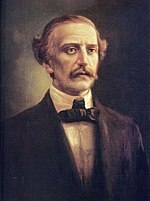 On 27 February 1844 Santo Domingo was again the capital of a free nation, when it gained its independence from Haiti, led by Dominican nationalist Juan Pablo Duarte. The city was a prize fought over by various political factions over the succeeding decades of instability. In addition, the country had to fight multiple battles with Haiti; the Battle of 19 March, Battle of 30 March, Battle of Las Carreras, and Battle of Beler, are a few of the most prominent encounters, mentioned in the national anthem and with city streets named after them. In 1861 Spain returned to the country, having struck a bargain with Dominican dictator Pedro Santana whereby the latter was granted several honorific titles and privileges, in exchange for annexing the young nation back to Spanish rule. The Dominican Restoration War began in 1863 however, and in 1865 the country was free again after Spain withdrew. The war claimed more than 50,000 lives. Over the next two-thirds of a century Santo Domingo and the Dominican Republic went through many revolutions, power changes, and occupation by the United States, 1916–24. The city was struck by hurricane San Zenón in 1930, which caused major damage. 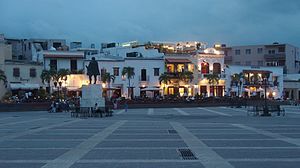 After its rebuilding, Santo Domingo was known officially as Ciudad Trujillo in honor of dictator Rafael Leónidas Trujillo, who governed from 1930. Following his assassination in 1961 the city was renamed back to Santo Domingo. It was the scene of street fighting during the 1965 United States occupation of the Dominican Republic. The year 1992 marked the 500th anniversary, El Quinto Centenario, of Christopher Columbus' Discovery of the Americas. The Columbus Lighthouse – Faro a Colón – was erected in Santo Domingo in honor of this occasion, with an approximate cost of 400 million Dominican pesos. View of Santo Domingo from space, 2010. The Ozama river flows 148 kilometres (92 miles) before emptying into the Caribbean Sea. Santo Domingo's position on its banks was of great importance to the city's economic development and the growth of trade during colonial times. The Ozama River is where the country's busiest port is located. The average temperature in Santo Domingo varies little, because the tropical trade winds help mitigate the heat and humidity throughout the year. Thanks to these trade winds, Santo Domingo has a tropical climate but seldom experiences the heat that one may expect to find. December through March are the coolest months with hot days with less humidity and fresh nights (temperatures of 17 to 19 °C (63 to 66 °F)). July through September are the warmest. Santo Domingo averages 1,445 millimetres (56.9 in) of rain annually. Its driest months are from November through April, however, due to the trade winds and mountains to the southwest, rain is seen even during these months. Because its driest month is just below 60 millimetres (2.4 in), Santo Domingo falls under the tropical monsoon climate category under the Köppen climate classification. Like many other cities in the Caribbean, Santo Domingo is very susceptible to hurricanes. Hurricane Georges caused severe destruction in September 1998. The lowest recorded temperature has been 11.0 °C (51.8 °F) on 5 February 1951 and 7 January 1957 and the highest is 39.5 °C (103.1 °F) on 29 May 2002. Panoramic view of Downtown Santo Domingo overviewing the Botanical Garden. (2014). View of sky scrapers in the Financial District at the Winston Churchill Avenue from Multi Centro. (2014). Many of Santo Domingo's most notable landmarks are located within the Zona Colonial district of the city, a UNESCO World Heritage Site since 1990. The Colonial Zone, bordered by the Río Ozama, also has an impressive collection of early 16th century buildings, including palatial houses and majestic churches that reflect the architectural style of the late Middle Ages. The city's most important historical buildings include the Catedral Santa María La Menor, the first cathedral of the Americas, which states its distinction; the Alcázar de Colón, the first castle in the Americas, once the residence of Viceroy of the Indies Don Diego Colón, a son of Christopher Columbus; the Monasterio de San Francisco, the ruins of the first monastery in the Americas; the Museo de las Casas Reales, in a monumental complex that includes the former Palace of the Governors and the building of the former Royal Audiencia of Santo Domingo; the Fortaleza Ozama, the oldest fortress in the Americas; the Pantéon Nacional, a former Jesuit edifice now hosting the remains of various renowned Dominicans; and the Dominican Convent, the first convent in the Americas. On the north end of Calle Las Damas, the restored and expanded Plaza de España is bordered by Las Atarazanas (former naval yard, now a museum) and a number of small shops and restaurants. This area was the first European commercial center in the Americas, and is still a hub of activity today. The Alcázar de Colón, having once been the colonial palace of the Columbus family - beginning with his son Diego – is now a museum displaying period furniture and decorations. The building was originally built in 1510, and restored to its current appearance in 1952. A 700 million US dollar investment was made in the Port of the Ozama river adjacent to the Ciudad Colonial aiming to turn Santo Domingo into a port of call for luxury cruise ships and including a privately owned marina. The project is being completed by Sans Soucí Ports S.A.
Panoramic view of the National District. The city proper of Santo Domingo is subdivided into incorporated areas (neighbourhoods) called sectores which could be considered as small urban towns. All sectores are serviced directly by the municipal mayor's office. Ciudad (city) – applies to the original older parts of town, many of which date back to the colonial times. Ensanche (lit. "widening") – usually, but not always, applied to the more "modern" parts of the city. Villa (village) – the urban outskirts of both the old city of Santo Domingo and the current (smaller) National District; originally they were separate villages, hence their names. The demographics of Santo Domingo are similar to other metropolitan areas of the country, except that the population of immigrants (mainly Haitians) is larger in the city because of the relative ease of finding work and the economic dynamism compared to other provinces. Santo Domingo, like most of the country, is made up of native-born Dominican mulattos, though there are large numbers of Afro-Dominicans and Euro-Dominicans, as well as a large immigrant community. In fact, over 20% of the city's population is immigrants, mainly Haitians. However, there are also recent immigrants from Europe, Asia, as well as other Latin American nations present in the city. The city of Santo Domingo has a significant community of Asians (mainly Chinese), Arabs (mostly Lebanese), and Europeans (mostly Spanish and Italian people) are also present in the city. There are also significant numbers of Venezuelans and Puerto Ricans, in the city, as well as US born Dominicans returning to their parents' home country. The northeast quadrant of the city is the poorest while the southwest is wealthier. Santo Domingo is also considered one of the epicenters of the growing Dominican middle-class. The city is one of the most economically developed cities in Latin America. Santo Domingo's population in 2010 was 3.8 million in the metropolitan area. Santo Domingo is the center of the national government of the Dominican Republic. The President's office and ministries, National Congress, Supreme Court of Justice, and other main government institutions are located in the metropolitan area. 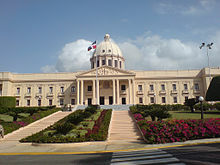 The city is administered by the Ayuntamiento del Distrito Nacional (City Hall), which is responsible for municipal functions. The current mayor of Santo Domingo is David Collado. The "Policía Nacional" (National Police) and "Policia Turística" (Tourist Police) (POLITUR) are tasked with enforcing city safety. The city is the center of economic activity in the Dominican Republic. It is where most of the country's wealth is concentrated and the seat of the national legislature, judicial, and executive government. Many national and international firms have their headquarters or regional offices in Santo Domingo. The city attracts many international firms and franchises such as Ikea, Goldcorp and Barrick due to its location and economic stability. Silver Sun Gallery mall and hotel, 2012. The infrastructure is suitable for most business operations. A key element that has helped the city grow and compete globally is the telecommunications infrastructure. Santo Domingo and the Dominican Republic as whole enjoy a modern and extensive telecommunications system liberalized in the late 1990s which has benefited from extensive foreign investment. This has attracted numerous call centers in recent years. Santo Domingo not only has an excellent telecommunications infrastructure but also a sizeable bilingual population that speaks English. The city's economic growth can be witnessed in the extensive vertical growth experienced across many of its neighborhoods. The construction boom is reflected in the many high density residential towers, shopping malls, elevated highways, the metro expansion and overall increase in commercial activity. Santo Domingo has a thriving middle class contrasting with the significant pockets of poverty that remain as challenges for the future. Marginalized slum conditions exist mostly in the northeast quadrant of the city with smaller pockets extending across the city. Areas of extensive development include the Poligono Central, which is bordered by the Avenida John F. Kennedy northward 27 February Avenue south, Avenida Winston Churchill to the west and Avenida Máximo Gómez to the east, and is characterized by its mixed development and its very active nightlife. Santo Domingo has areas of high development, among them Serralles, Naco, Arroyo Hondo, Piantini, Urb Fernandez, Ens. Julieta, Paraiso, Los Prados, Bella Vista, Sarasota and other sectors, where most of the middle class can be found. Bella Vista and La Esperilla are currently the fastest growing sectors with large mega -projects. Gazcue belongs to the more traditional southeastern area of the city and is known for its buildings dating from the 1930s to the 1960s. The performing arts are very important in Santo Domingo. The city has its own symphonic orchestra, chamber orchestra, opera company, ballet company, folkloric company, and national theater, including a number of smaller groups. The Plaza of culture is the center of activity, but there are concerts, ballet, folklore, and other performances throughout the city. Casa de Teatro is the gathering place of avant garde artists, actors, and musicians. It stages art and literature exhibitions and offers painting, drama, and dancing courses and monthly contests for poetry, short stories, and other forms of literature. Santo Domingo is the location of numerous museums, many of which are located in the Zona Colonial district. In the Zona Colonial is the Museum of Alcázar, in Diego Colon's restored palace, the Museum of the Casas Reales, with artefacts of the colonial period and a collection of ancient weapons donated by Trujillo, the Naval Museum of the Atarazanas, in the former naval yards, Museo de la Catedral, Museo Memorial de la Resistencia Dominicana, documenting the struggle for freedom during the regimes of Trujillo and Balaguer, Museo Duarte, dedicated to the hero of Dominican independence, and the World of Ambar Museum. Plaza de la Cultura also houses the city's most important cultural venues, including the Teatro Nacional (National Theater) and various museums; the Palacio Nacional, which houses the Presidency of the Dominican Republic; the Palacio de Bellas Artes (Palace of Fine Arts), a neoclassical building that is the permanent home of the country's National Symphony Orchestra; and the Boulevard 27 de Febrero, a pedestrian promenade located on the busy Avenida 27 de Febrero, which displays works of art from prominent Dominican artists and sculptors. Another attraction is the Centro Olímpico Juan Pablo Duarte, a sports complex in the center of Santo Domingo. This complex was used during the 2003 Pan American Games. In the Plaza de la Cultura are the Museum of the Dominican Man, with artifacts from the pre-Columbian Taíno civilization, the National Museum of History and Geography, the Museum of Natural History and the Museum of Modern Art. Other museums include the Museo Bellapart, a prominent private collection of 19th- and 20th-Century Dominican painting and sculpture and the Museo Prehispanico, a major private collection of pre-Columbian Taíno art. The city has various parks, many of which are relatively large. Santo Domingo (D.N) is surrounded by the Santo Domingo Greenbelt. Mirador Norte Park lies in the north of the city, close to Villa Mella and Mirador Sur Park is located in the southwest section of the city. Mirador del Este is located on the East bank of the Ozama river and it is the seat of the Columbus Lighthouse. Independencia Park and Colón Park are located in Zona Colonial. There are eighteen universities in Santo Domingo, the highest number of any city in the Dominican Republic. 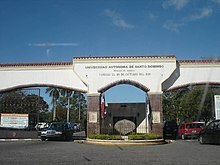 Established in 1538, the Universidad Autónoma de Santo Domingo (UASD) is the oldest university in the Americas and is also the only public university in the city. Santo Domingo holds the nation's highest percentage of residents with a higher education degree. Santo Domingo is the terminus for four of the five national highways. 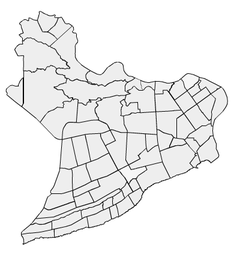 The city is connected to the southwest of the country by the national highway DR-2 (Avenida George Washington and Autopista 30 de Mayo), and with the cities of the country's northwest by DR-1 (Expreso Kennedy, Corredor Duarte), which serves as a direct link to the city of Santiago de los Caballeros. DR-3 (Expreso 27 de Febrero/Autopista de Las Américas) connects Santo Domingo directly to the east of the country, including the cities of San Pedro de Macorís, La Romana, and major tourist sites such as Punta Cana and Bávaro, and to the Samaná Province (in the northeast) via the Samana Highway. In the city, motoconchos (motorcycle taxis), guaguas/voladoras (low quality public buses), and carros públicos/conchos (shared taxis) are common modes of transport. Expreso John F. Kennedy: This expressway crosses the National District from east to west in the north-central part. The Avenue consists of a total of ten lanes, five on each side. The two center lanes of the road are express lanes to facilitate transit. It also has several bypasses and elevated crossings. Avenida 27 de Febrero: It is the main avenue to cross the National District from east to west in the central part of Santo Domingo. It starts at the Juan Bosch bridge and crosses the entire city until the roundabout at the Plaza de la Bandera, which extends into the town of Santo Domingo West and ends on the Duarte Highway. The thoroughfare is composed of a total of ten lanes. Five on each side. The four lanes in the center of the avenue are express that facilitate transit in the city from east to west, with several elevated cross streets, overpasses and tunnels. It also has exclusive bus lanes. Avenida Simón Bolívar: It extends from Independence Park to the junction with the Avenue Winston Churchill. In its entirety, this avenue is composed of two local lanes one-way east- west. Avenida Independencia: It extends from the intersection with Avenida Gregorio Luperón to Independence Park. The avenue consists of a total of four lanes (two eastbound and two westbound ) from crossing with Av G. Luperon to the intersection of Avenida Italia . From the junction with Av Italy until Independence Park Avenue becomes one-way eastbound and contains only two lanes. Avenida George Washington: It is colloquially referred as "El Malecón" This is Santo Domingo's Maritime Boulevard, running alongside the Caribbean sea's waterfront. It extends from Palo Hincado Street to the intersection with Abraham Lincoln Avenue; from that point to the Haina River Highway 30 May extends also includes President Billini Walk, which starts in Palo Hincado street and joins the Avenida del Puerto along the western bank of the Ozama River. Throughout its entire length it is composed of four lanes (two on each side). On this Boulevard you will find the most exclusive hotels in the city, several casinos, the mixed business and residential high rise complex Malecón Center, the Obelisk and Eugenio María de Hostos' Park. This is also the Boulevard where the Santo Domingo Carnival parade takes place. Avenida Winston Churchill: It extends from Kennedy Avenue to Avenida 27 de Febrero, from there on, it continues as Avenida Jimenez Moya to reach the Centro de los Heroes and finally the boardwalk. This thoroughfare is distinguished by its date palms that are planted on the sidewalks . Throughout its length the road is composed of six lanes (three on each side) and a large wooded median popularly known as Boulevard de la Churchill ("Churchill's Boulevard") and within this lies the Boulevard of the Stars. Avenida Abraham Lincoln: extends from Avenida Kennedy to the seawall. The route consists of six lanes (three on each side) and a median suitable for jogging laid with palm trees. It traverses the city's commercial and leisure city centre. Avenida José Ortega y Gasset: It extends from the Paseo de los Reyes Católicos Avenue until 27 de Febrero. The avenue consists of four lanes, two on each side. Along this avenue lies the Centro Olímpico Juan Pablo Duarte athletic complex and the Hospital General de la Plaza de la Salud medical complex. Avenida Tiradentes: It extends from the jetty in the south, through the state's university Universidad Autónoma de Santo Domingo. 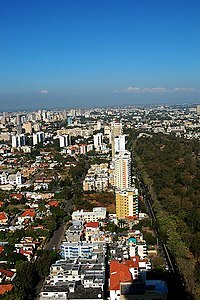 It extends to the north along Avenida 27 de Febrero, John F. Kennedy, and continuing north past the city's baseball stadium Estadio Quisqueya until it reaches the Parque Zoológico Nacional National Zoo. Avenida Gregorio Luperón: It extends from Kennedy Avenue to Highway 30 May on the western edge of Santo Domingo. The thoroughfare consists of eight lanes, four on each side and a landscaped median. Local attractions located on this strip includes Gallístico Center Herrera Industrial Zone, and the Plaza de la Bandera. Avenida Máximo Gómez y Báez: The city's main south-north avenue, it extends from the Malecón to the Presidente Peynado bridge. The boulevard consists of four lanes, two on each side. Major buildings and points of interest along this boulevard are: the National Cemetery, Plaza de la Cultura which houses the National Theatre and the Palace of Fine Arts. There are also two universities (UNAPEC and UTESA), as well as the headquarters of the People's Bank and five star hotel "Hotel Barceló Santo Domingo". Avenida Juan Pablo Duarte: It extends from the intersection of Avenida Paseo and Martyrs of the Catholic Monarchs to Calle Padre Billini in the Colonial Zone . The avenue consists of three lanes on a road north-south direction becomes one lane to enter the Colonial Zone . This avenue is the main commerce route for low-income people throughout the metropolitan area with department stores, restaurants, and shops that offer goods and services at modest prices . In "Duarte" (as popularly known) you can find the New Market, the Enriquillo Park, Duarte Commercial Square and Santo Domingo's Chinatown. 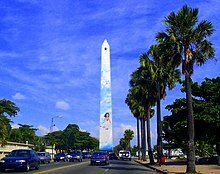 Avenida Nicolás de Ovando y Cáceres: Is located on the northern part of Santo Domingo starting at the roundabout Cristo Rey sector and corner with Ortega y Gasset, Máximo Gómez, Arbert Duarte and Thomas avenues, among others; culminating in the sector of Simón Bolívar . This avenue is characterized by many businesses that sell auto parts . Santo Domingo has an underground and elevated rapid transit metro system. It is the most extensive metro in the Caribbean and Central American region by total length and number of stations. The Santo Domingo Metro is part of a major "National Master Plan" to improve transportation in the city as well as the rest of the nation. The first line was planned to relieve traffic congestion in the Máximo Gómez and Hermanas Mirabal Avenue. The second line, which opened in April 2013, is meant to relieve the congestion along the Duarte-Kennedy-Centenario Corridor in the city from west to east. As of August 2013, the metro consists of these two lines. Four more lines are planned to be constructed in the near future, for a total of six. Before the opening of the second line, 30,856,515 passengers rode the Santo Domingo Metro in 2012. According to government figures more than 300,000 people ride the 31 kilometer system on a daily basis. In 2018 a 5 kilometer Santo Domingo cable car (teleferico) was opened to the public with the purpose to provide service to the poorest areas to the east and north of the metropolitan area and serve as a feeder for the metro. The cable car is used by more than 12,000 people daily. Santo Domingo is served by two airports. Aeropuerto Internacional La Isabela a newly constructed airport located in the northern section of the city, within kilometres of the city center. It serves mostly domestic and charter flights. The major international airport that serves the city is Santo Domingo Las Americas, which serves North, Central and South America and also Europe. The Port of Santo Domingo is located on the Ozama River. Its location at the center of the Caribbean is well suited for flexible itinerary planning and has excellent support, road and airport infrastructure within the Santo Domingo region, which facilitate access and transfers. The port is suitable for both turnaround and transit calls. The port's renovation is part of a major redevelopment project, aimed at integrating the port area and the Zona Colonial and foster a cruise, yacht, and high-end tourism destination. Supported by legislation approved in 2005, the project, developed by the Sans Souci Group, also includes the development of a new sports marina and a 122-acre (0.49 km2) mixed-leisure real estate development adjacent to the port. Baseball is the most popular sport in the country. Santo Domingo is home to two of the six teams in the Dominican Professional Baseball League. Tigres del Licey, founded in 1907, have won 22 national championships since 1951. It is the most senior national team, winning 10 Caribbean Series titles as well. Leones del Escogido, founded in 1921, are winners of 15 national championships since 1951. It is the third team with the most championships won. The team has 4 titles won in the Caribbean Series. These two teams are based in the Estadio Quisqueya Juan Marichal located in Ensanche La Fe. Santo Domingo's Basketball Tournament Superior is held in the National District each year, with several teams participating and representing several sectors and social clubs of the city. There are 15 television stations (both UHF and VHF) in Santo Domingo. Santo Domingo has the greatest number of television signals in the country, followed by Santiago. Additional cable television channels are provided by companies like Aster, Cable TV Dominicana, SKY Dominicana, and Telecable. In Santo Domingo there are 100 different stations in AM frequency and 44 in FM frequency. ^ a b "Expansión Urbana de las ciudades capitales de RD: 1988-2010" (in Spanish). Santo Domingo: Oficina Nacional de Estadística. 1 May 2015. ISBN 978-9945-8984-3-9. Archived from the original on 14 July 2016. Retrieved 25 January 2016. ^ Perez, Cosme E. (20 December 2011). Quisqueya: un pas̕ en el mundo: La Revelacin̤ Maya Del 2012. Palibrio. p. 27. ISBN 978-1-4633-1368-5. Retrieved 4 June 2012. ^ Greenberger, Robert (1 January 2003). Juan Ponce de León: The Exploration of Florida and the Search for the Fountain of Youth. The Rosen Publishing Group. p. 35. ISBN 978-0-8239-3627-4. Retrieved 4 June 2012. ^ Bolton, Herbert E.; Marshall, Thomas Maitland (30 April 2005). 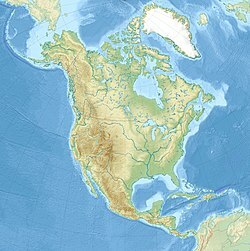 The Colonization of North America 1492 to 1783. Kessinger Publishing. p. 17. ISBN 978-0-7661-9438-0. Retrieved 4 June 2012. ^ Clayton, Lawrence A. (25 January 2011). Bartolom de Las Casas and the Conquest of the Americas. John Wiley & Sons. p. 19. ISBN 978-1-4051-9427-3. Retrieved 4 June 2012. ^ a b Floyd, Troy (1973). The Columbus Dynasty in the Caribbean, 1492-1526. Albuquerque: University of New Mexico Press. pp. 55, 73. ^ a b "Dominican Republic – THE FIRST COLONY". Library of Congress. Retrieved 18 March 2009. ^ Marley, David (1998). Wars of the Americas. ABC-CLIO. pp. 148–149. ISBN 9780874368376. ^ "Elections and Events 1791–1849". University of California-San Diego. Retrieved 18 March 2009. ^ "City street map of Santo Domingo at www.colonialzone-dr.com" (PDF). Retrieved 20 March 2009. ^ Haïti République Dominicaine-Une Île pour deux (1804-1916). ^ Derby, Lauren (26 June 2009). The Dictator's Seduction: Politics and the Popular Imagination in the Era of Trujillo. Duke University Press. p. 66. ISBN 978-0-8223-4482-7. Retrieved 4 June 2012. ^ a b "Secretaría de Estado de Cultura". Retrieved 18 March 2009. ^ a b Mejía, Mariela (7 January 2011). "Frío extremo, calor agobiante" (in Spanish). Diario Libre. Retrieved 2 May 2017. ^ "Santo Domingo Climate Normals 1961–1990". National Oceanic and Atmospheric Administration. Retrieved 2 May 2017. ^ "Station Santo Domingo" (in French). Meteo Climat. Retrieved 2 May 2017. ^ Moré, Gustavo Luis; Bergdoll, Barry (30 June 2010). Caribbean Modernist Architecture. The Museum of Modern Art. p. 8. ISBN 978-0-87070-775-9. Retrieved 4 June 2012. ^ Clammer, Paul; Grosberg, Michael; Porup, Jens (1 October 2008). Dominican Republic and Haiti. Lonely Planet. p. 79. ISBN 978-1-74104-292-4. Retrieved 4 June 2012. ^ DK TRAVEL GUIDES (1 September 2011). DK Eyewitness Top 10 Travel Guide: Dominican Republic. Dorling Kindersley Limited. p. 77. ISBN 978-1-4053-6102-6. Retrieved 4 June 2012. ^ Harvey, Sean; Fullman, Joe (1 January 2009). The Rough Guide to the Dominican Republic. Rough Guides. p. 90. ISBN 978-1-85828-811-6. Retrieved 4 June 2012. ^ Otfinoski, Steven (30 January 2005). Juan Ponce de León: Discoverer of Florida. Marshall Cavendish. p. 19. ISBN 978-0-7614-1610-4. Retrieved 4 June 2012. ^ Gray, Dulce María (2001). High Literacy and Ethnic Identity: Dominican American Schooling in Transition. Rowman & Littlefield. p. 38. ISBN 978-0-7425-0005-1. Retrieved 4 June 2012. ^ "Estadísticas de peaje y tiempo de recorrido al 2013" [Statistics of tolls and times of route 2013] (PDF). Oficina para el Reordenamiento de Transporte (OPRET) (in Spanish). p. 2. Retrieved 17 September 2013. ^ "Metro de Santo Domingo establece récord en transporte de pasajeros en el 2018; Metro y Teleférico montan más de 89 millones usuarios". Armario Libre (in Spanish). Santo Domingo. 7 January 2019. Retrieved 23 January 2019. ^ a b c d "Memoria Anual, Agosto 2002-Agosto 2003" (PDF). Ayuntamiento del Distrito Nacional. pp. 66–67. Archived from the original (PDF) on 19 August 2008. Retrieved 23 July 2008. ^ "Mapa Mundi de las ciudades hermanadas". Ayuntamiento de Madrid. Retrieved 23 July 2008. ^ "Universidade norte-americana fará parceria com a Câmara Municipal de Manaus". Jusbrasil.com. Archived from the original on 21 July 2011. Retrieved 4 June 2012. Wikimedia Commons has media related to Santo Domingo. Wikisource has the text of a 1911 Encyclopædia Britannica article about Santo Domingo.